On Wednesday, Interpol issued wanted people alerts for four corporate executives and two former senior officials with FIFA, just a day after the surprising resignation of Sepp Blatter the President of soccer’s world governing body. As more questions over corruption at FIFA have renewed the scrutiny on the winning bids for the World Cup of Qatar and Russia, officials from each country insisted that the right to host those games was not being threatened. Blatter, who was in charge of FIFA for the past 17 years, was seen as an influential and towering figure of global sports, but resigned Tuesday. His announcement came only four days after he won reelection as the FIFA president, as officials in law enforcement in the U.S. confirmed he was being investigated for corruption that has ensnared the soccer governing body. Blatter became defiant after he won his fifth term saying he could forgive but not forget. That had many wondering why he made such an about-face. However, that might all be answered today when a New York judge should release a transcript of a hearing in 2013 where Chuck Blazer a former executive committee member at FIFA now cooperating with authorities in the U.S. pled guilty to charges of wire fraud, money laundering and racketeering as part of the investigation into global soccer corruption. The alerts by Interpol include those for Jack Warner the former vice president at FIFA who is a native of Trinidad and Tobago. He has been accused of taking bribes with awarding the World Cup in 2010 to South Africa. Paraguayan Nicolas Loez is former executive committee member of FIFA, Mariano and Hugo Jinkis, Alejandro Burzaco, and Jose Margulies. 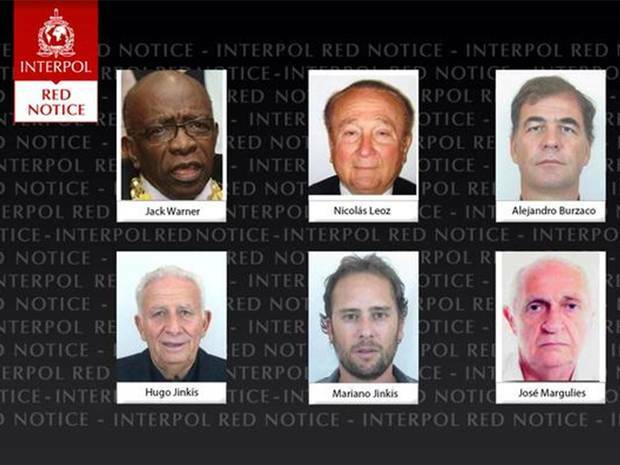 On its website, Interpol said the six were wanted for charges ranging from corruption to conspiracy and racketeering. 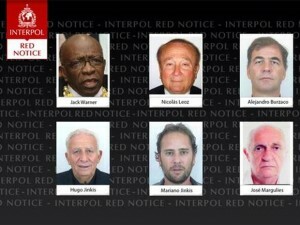 Red notices, like the ones Interpol issued on the six on Wednesday are to inform member nations that there has been an arrest warrant issued for the person and Interpol is looking for where they are located and want them arrested with the idea of extraditing them. However, the red notices are not arrest warrants and other countries are not compelled to arrest that person or persons.